No 4th of July jubilee is complete without potato salad. In fact, going without it is simply un-American. 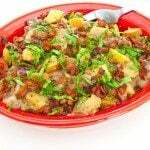 So, to show how completely Patriotic (or uber clever and creative in the kitchen) I am, I have Americanized my Bacon & Brown Sugar Sweet Potato Salad by using colorful ingredients and adding more bacon and a smidge of bacon drippings. Trader Joe’s also helped me out by bundling together a handy, dandy bag of red potatoes, white potatoes, and purple potatoes…which we are totally pretending are blue. I mean…hello?!? Red, white, and blue potatoes?!? 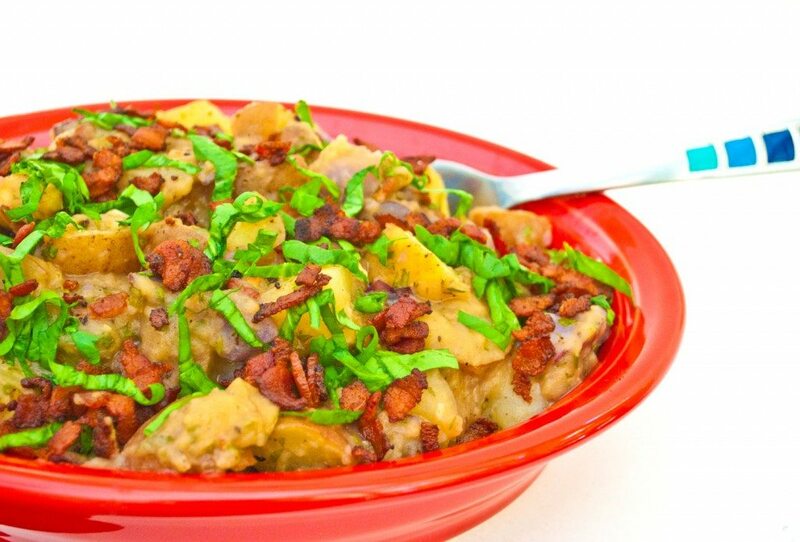 Now, if I could only take credit for actually being the first one to ever post a tri-color potato salad recipe then my 4th of July would be complete before it even started. 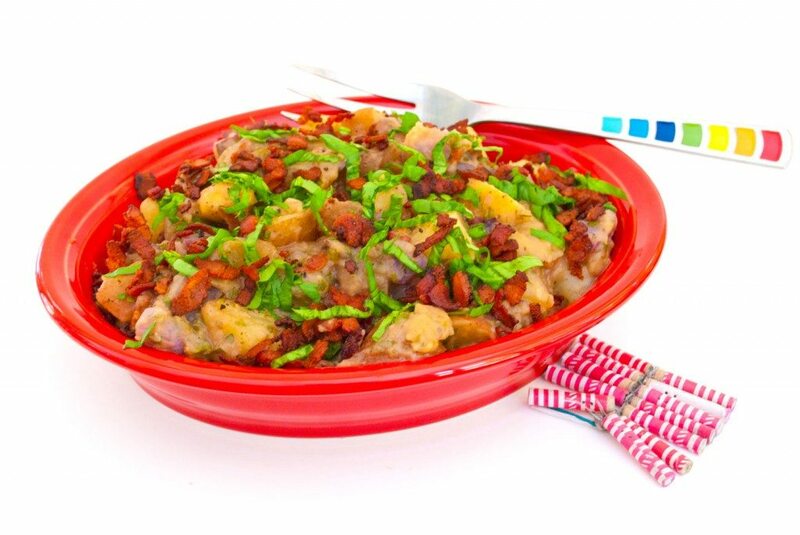 We could all take credit for being the first in our families to bring a red, white, and blue potato salad to a shindig! What recipe do you make that your family adores? What is favorite thing to get from Trader Joes? Any plans for the 4th? 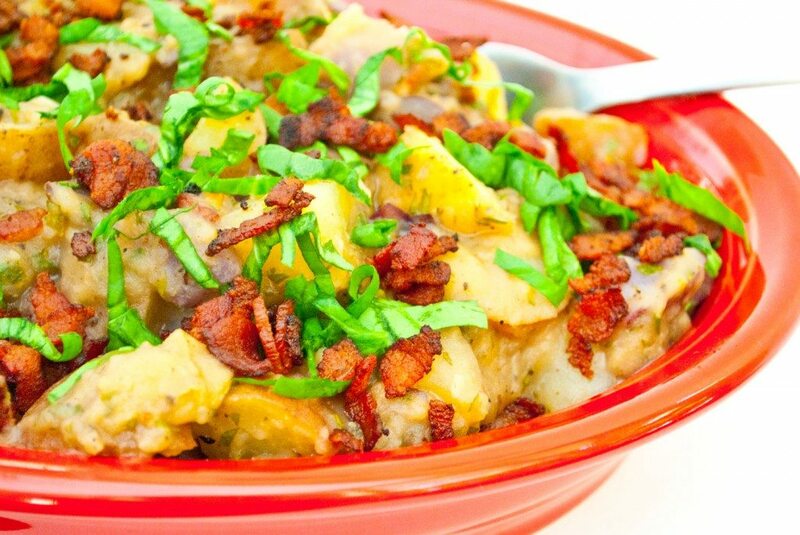 Wash and dry potatoes, chop into bite size pieces, and place in a large stock pot. Add enough water to cover the potatoes, cover with a lid, and bring to a boil over high heat. Once boiling, lower heat to med-high, remove lid, add salt, stir, and continue boiling for 15 mins or until fork tender and cooked through. While potatoes are boiling, pre-heat a saute pan over medium high heat and slice bacon into thin strips. Once pan is hot, add oil and then bacon, and fry until golden brown and crispy. In a separate bowl, whisk together vinegar, mustard, brown sugar, and bacon drippings until well combined. Add salt and pepper to taste. Set aside. Using the same pan the bacon was cooked in, saute garlic and onion over medium to med-high heat until soft and translucent, about 3-4 mins. Whisk into the dressing. 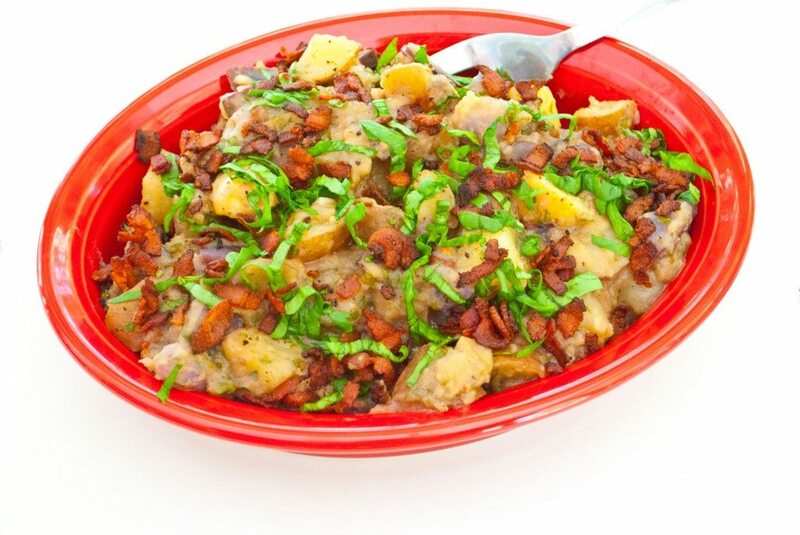 Once potatoes are cooked, drain completely, and add them directly to the dressing, stirring until well coated. Stir in half of the bacon bits and half of the herbs until evenly distributed. To serve, sprinkle with the remaining bacon and herbs. This sounds phenomenal! Are you bringing it to Aunt Debbie’s house? What should I make? Any requests? Is everyone going to Aunt Debbie’s on the actual 4th?!? If so, we may actually be able to go! If we can, I will definitely bring it! I have been dreaming about this ALLLL DAYYYY… OMG..